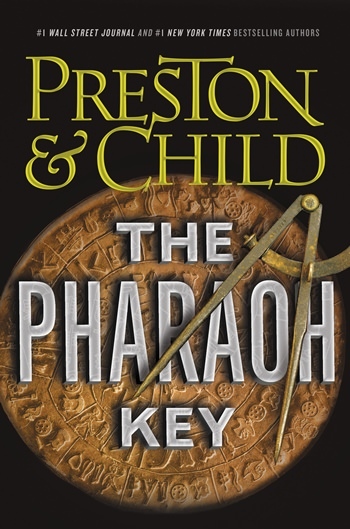 Gideon Crew has nothing left to lose, so he decides to go out with a bang in “The Pharaoh Key,” Preston & Child’s latest — and supposedly final — story to feature their intrepid hero. Effective Engineering Solutions has closed shop and fired everyone, including Crew. To make things worse, a checkup on his medical condition proves that it’s still a death sentence; he will be lucky to survive six months. So when former co-worker Manuel Garza asks for help to get answers from the elusive CEO of the now defunct company, Crew agrees. They are both denied an opportunity to talk to Eli Glinn, but while cleaning out the remainder of their stuff from their desks, they discover a computer that has completed a job it was assigned years ago to decipher strange writings on a stone tablet. The data indicates a possible treasure in the middle of a dangerous section of southwest Egypt, so they decide to abscond with the information and claim the potential rewards for themselves. What they will uncover is both treacherous and surprising, and one person’s treasure is another person’s nightmare. The quest might kill them, but since Crew is on borrowed time anyway, he tries to remain unflappable.